Let’s begin with acknowledging that pun titles are the best kind of titles, shall we? 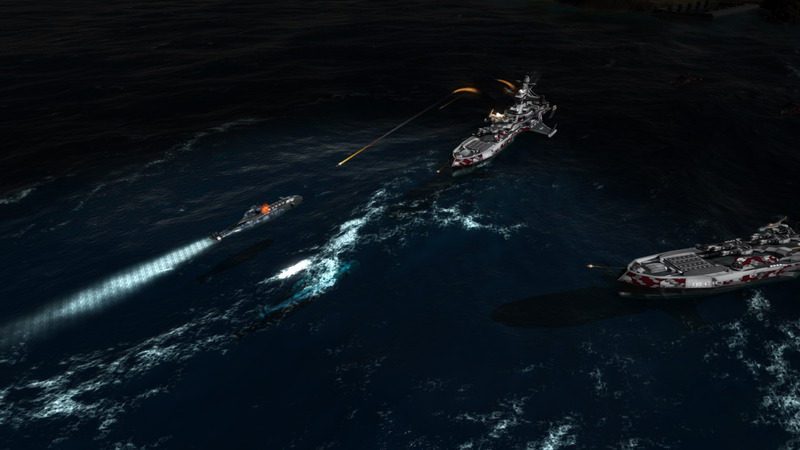 This time we’re taking a look at yet another major set of game mechanics: Submarines, using the TDN Type-192 Attack Submarine as our test subject. The Type-192 is armed with several torpedo tubes effective against ships, submarines and naval structures, along with 10 cruise missile launchers, effective against surface and ground targets, activated with an ability. It’s the only submarine available to the TDN, and best suited for ambushes and to hunt enemy submarines. 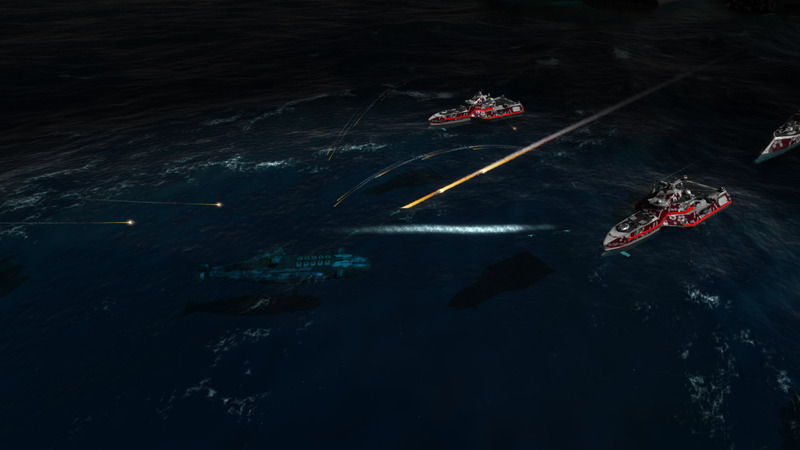 Submarines can freely switch between diving and surfacing, though heavily damaged submarines will be forced to surface. 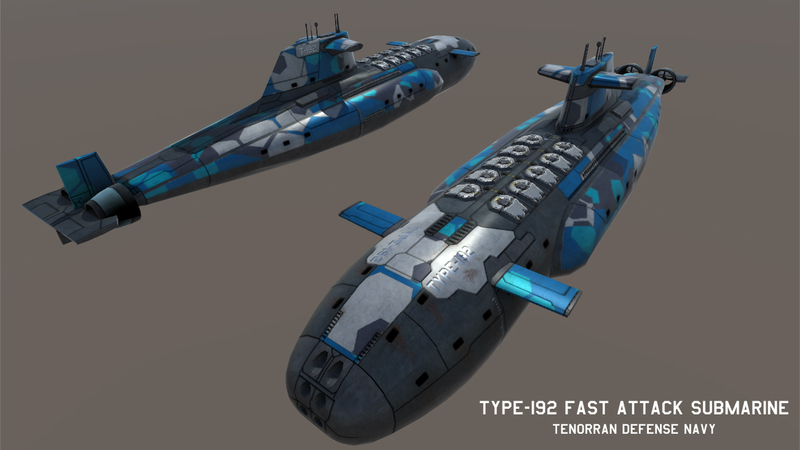 There are going to be a variety of submarines in Ardent Seas, with different abilities and weapons. Submarines that are out of fuel will likewise surface. Submarines are invisible to the enemy while underwater. There are numerous ways of finding them, however. When a submarine fires its missiles or torpedoes, or whichever weapon it may have, it becomes visible to all players. Some ships are equipped with special submarine-hunting equipment, such as Destroyers and submarine warfare aircraft. Depth charges also reveal all submarines in a wide area, and will cripple them if they happen to detonate next to them. Most ordinary weapons can’t fire on submarines. Some units have special anti-submarine weaponry, in the form of torpedoes, anti-submarine missiles and anti-submarine grenades. For the Coalition Navy, we have planned an much more diverse set of submarines. They will be receiving a submersible aircraft carrier, a submarine warship which is armed with 2 gun turrets that can only be used on the surface, a long-range missile submarine, a hunter-killer submarine, similar in role to the Type-192 shown here, and their harvesting unit is also a submarine. As always, you can follow us on Twitter @Ardent_Seas, Facebook and IndieDB.